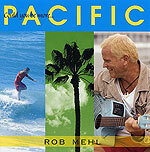 CD review: "Could You Be More Pacific?" This review first appeared in the July 26, 2007 issue of the North County Times. Oceanside's Rob Mehl's new album is a sun-drenched album of beach music so soaked with tropical ambience you can practically smell the sunscreen while listening. Equal parts Jimmy Buffett and Hawaiian slack key with a dash of Latin, the music here is built around Mehl's warm voice and relaxed delivery. While there are some electric guitar and keyboards here and there, for the most part the album is an acoustic affair  and even on the electrified songs, it's a very mellow groove. Think Poco more than the Beach Boys. Eleven of the 14 songs were written by Mehl, and all are have a pleasant melodicism to them. "Could You Be More Pacific?" is a nice, fun listen that will transport you straight to your favorite beach.